A group of criminals brutally assault two teenage girls, while on the run from the cops. During a storm, the gang seeks refuge in a house owned by the parents of one of the girls. When the parents discover what their guests have done, they decide to exact revenge. Last House ’09 is decent fare. It certainly doesn’t go as far as the original, but I don’t think that old ‘never cut away’ mentality they had back then is possible nowadays. Even Craven has said himself that he and his crew didn’t realize how extreme their product really was until they were shooting it. However, I don’t want to sugarcoat things here. Watching the fate of the two girls (played by Sara Paxton and Martha MacIsaac) this time around isn’t a pleasant affair either, but comparatively, they get off slightly easier than their 1972 counterparts. In some cases, what the remake leaves out works in its favour. Gone are the bumbling cops from Craven’s version. I understand the purpose the cops – as well as David Hess’ guitar blues score – served, but the 2009 version is a different beast. And with that, I’d say that director Dennis Iliadis succeeds on making the subject matter his own. Last House ’09 has that gritty seventies feel, but strangely also feels unquestionably modern. The acting in this movie is tops all around, but I want to make special mention of Tony Goldwyn and Monica Potter. I thought they did an exceptional job of portraying the parents of one of the victims. When they came to the realization of what had been done to their daughter and who was responsible, you really see it come over them. Something I found distracting was how dark a lot of the interior sequences were. I understand these events happen at night, but I AM the viewer here, and should be able to SEE what’s going on. All I’m saying is a little more light would have been nice. There’s a bit at the end that seems excessive (anybody who has seen the trailer can guess what that might be) and out of place, but I’m sure it was one of those ‘oh, we have to put THAT in’ ideas from early on that no one ever thought to question. 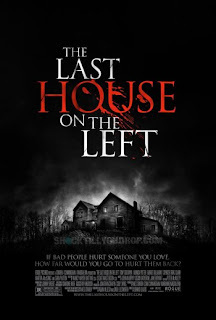 Last House On The Left ’09 is a serviceable remake and a good film. It’s not going to knock your socks off, but it is a well-told tale with fine performances. Oh, and the Death In Vegas song that plays out the movie was an excellent choice, as well.